Youtube videos are everywhere these days. Slideshare introduced feature to embed and play any Youtube video in any slide in your SlideShare presentation. Now, even Gmail Chat will play any Youtube video for you. So, if your friend sends you Youtube link while chatting on Gmail chat – no need to open a new window to play that video. 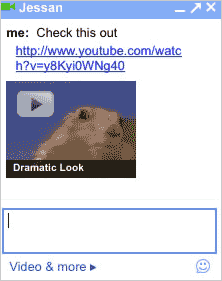 Just click the preview link in Gmail chat and video will play in the chat window itself. Besides Youtube videos, it also works for Google Videos. Incase your Gmail chat friend is not understanding your text chatting, send him a witty Youtube video to get the message across his head. This new feature for sure will make chatting experience better with touch of interactivity in motion!